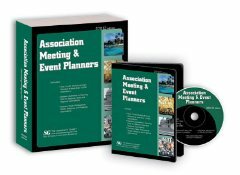 Association Meeting & Event Planners will provide you with precious resources such as contact names and meeting details, putting you on the inside track to successful business relationships. Each of the more than 17,700 national association listings contains vital information such as the association name, address, phone and fax numbers, Web site address, general e-mail address and contact names and titles. In good times and bad, associations represent a stable source of meetings business. Association Meeting & Event Planners opens the door to this valuable market. Each of the more than 13,000 association planner listings includes the association name, street address, phone and fax numbers, Web site address and contact names and titles. Event details include the type of meetings, locations, number of meetings, length of meetings, number of attendees, and the number of years booked in advance. And the directory includes more than 5,200 state and regional associations, too! Four easy-to-use indices are included in the directory. The Alphabetical Company index lists each company in the directory as well as its location, and the Acronym index lists national associations by abbreviation. The Speakers and Entertainers indexes list all the organizations that hire speakers or entertainers for their meetings. The CD-ROM edition contains a fully searchable, comma-delimited data file that can be imported and used with most database or data management applications including: ACT, Microsoft Access, Microsoft Excel, dBase, Goldmine and more! THIS TITLE IS ONLY AVAILABLE IN CD VERSION - Printed book has been terminated.